This is so good I need to REPOST! All Saints Day will be coming up pretty quickly. We're talking about all the saints who have gone before us and we have a number of pretty young children who don't really understand the ideas of death, saints, and heaven. They're pretty concrete thinkers. So, I suggested to my pastor that he hand out little paper trumpets or kazoos and let the kids celebrate all the people who are in heaven with Jesus and that we will be there with them some day too. You can add a short Bible verse too, and let the kids walk around a bit playing their horns and shouting the verse or something along the lines of "In God's house there's a room for me!" 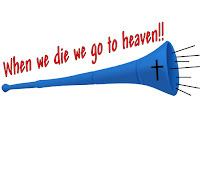 or, "When we die we go to heaven!" This way, whenever they play the horn or kazoo, hopefully, they'll remember what they said too! Another option is to get the rest of the congregation involved. Perhaps they could all sing I Sing a Song of the Saints of God and for the last verse the kids could play their horns as the congregation sings. LUTHERAN SCHOOLS: Morning Meeting Anyone?